Use the Reynolds number for a system to determine whether it is laminar or turbulent. Sometimes we can predict if flow will be laminar or turbulent. 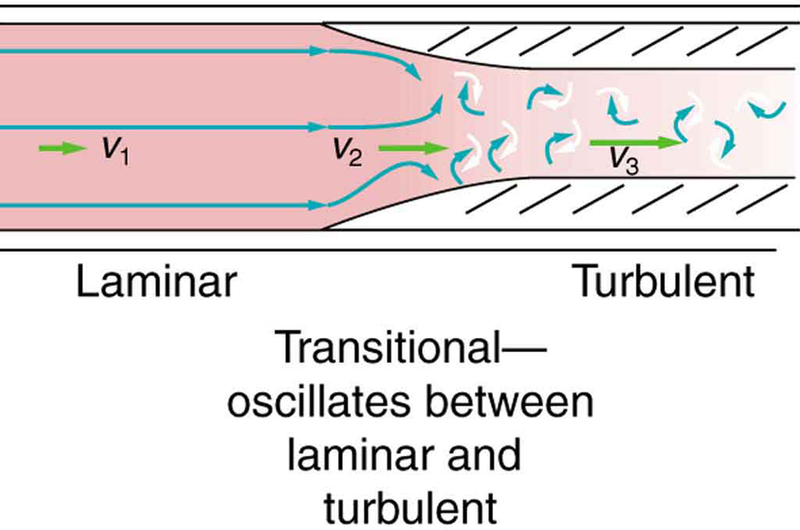 We know that flow in a very smooth tube or around a smooth, streamlined object will be laminar at low velocity. We also know that at high velocity, even flow in a smooth tube or around a smooth object will experience turbulence. In between, it is more difficult to predict. In fact, at intermediate velocities, flow may oscillate back and forth indefinitely between laminar and turbulent. An occlusion, or narrowing, of an artery, such as shown in Figure 1, is likely to cause turbulence because of the irregularity of the blockage, as well as the complexity of blood as a fluid. Turbulence in the circulatory system is noisy and can sometimes be detected with a stethoscope, such as when measuring diastolic pressure in the upper arm’s partially collapsed brachial artery. These turbulent sounds, at the onset of blood flow when the cuff pressure becomes sufficiently small, are called Korotkoff sounds. Aneurysms, or ballooning of arteries, create significant turbulence and can sometimes be detected with a stethoscope. Heart murmurs, consistent with their name, are sounds produced by turbulent flow around damaged and insufficiently closed heart valves. Ultrasound can also be used to detect turbulence as a medical indicator in a process analogous to Doppler-shift radar used to detect storms. Figure 1. Flow is laminar in the large part of this blood vessel and turbulent in the part narrowed by plaque, where velocity is high. In the transition region, the flow can oscillate chaotically between laminar and turbulent flow. where is the fluid density, its speed, its viscosity, and the tube radius. The Reynolds number is a unitless quantity. Experiments have revealed that is related to the onset of turbulence. For below about 2000, flow is laminar. For above about 3000, flow is turbulent. For values of between about 2000 and 3000, flow is unstable—that is, it can be laminar, but small obstructions and surface roughness can make it turbulent, and it may oscillate randomly between being laminar and turbulent. The blood flow through most of the body is a quiet, laminar flow. The exception is in the aorta, where the speed of the blood flow rises above a critical value of 35 m/s and becomes turbulent. Example 1: Is This Flow Laminar or Turbulent? We have all of the information needed, except the fluid speed which can be calculated from (verification of this is in this chapter’s Problems and Exercises). Since is well below 2000, the flow should indeed be laminar. Under the conditions of normal activity, an adult inhales about 1 L of air during each inhalation. With the aid of a watch, determine the time for one of your own inhalations by timing several breaths and dividing the total length by the number of breaths. Calculate the average flow rate of air traveling through the trachea during each inhalation. The topic of chaos has become quite popular over the last few decades. A system is defined to be chaotic when its behavior is so sensitive to some factor that it is extremely difficult to predict. The field of chaos is the study of chaotic behavior. A good example of chaotic behavior is the flow of a fluid with a Reynolds number between 2000 and 3000. Whether or not the flow is turbulent is difficult, but not impossible, to predict—the difficulty lies in the extremely sensitive dependence on factors like roughness and obstructions on the nature of the flow. A tiny variation in one factor has an exaggerated (or nonlinear) effect on the flow. Phenomena as disparate as turbulence, the orbit of Pluto, and the onset of irregular heartbeats are chaotic and can be analyzed with similar techniques. For below about 2000, flow is laminar. For above about 3000, flow is turbulent. For values of between 2000 and 3000, it may be either or both. 1: Doppler ultrasound can be used to measure the speed of blood in the body. If there is a partial constriction of an artery, where would you expect blood speed to be greatest, at or nearby the constriction? What are the two distinct causes of higher resistance in the constriction? 2: Sink drains often have a device such as that shown in Figure 2 to help speed the flow of water. How does this work? Figure 2. You will find devices such as this in many drains. They significantly increase flow rate. 3: Some ceiling fans have decorative wicker reeds on their blades. Discuss whether these fans are as quiet and efficient as those with smooth blades. 1: Verify that the flow of oil is laminar (barely) for an oil gusher that shoots crude oil 25.0 m into the air through a pipe with a 0.100-m diameter. The vertical pipe is 50 m long. Take the density of the oil to be and its viscosity to be (or ). 2: Show that the Reynolds number is unitless by substituting units for all the quantities in its definition and cancelling. 3: Calculate the Reynolds numbers for the flow of water through (a) a nozzle with a radius of 0.250 cm and (b) a garden hose with a radius of 0.900 cm, when the nozzle is attached to the hose. The flow rate through hose and nozzle is 0.500 L/s. Can the flow in either possibly be laminar? 4: A fire hose has an inside diameter of 6.40 cm. Suppose such a hose carries a flow of 40.0 L/s starting at a gauge pressure of The hose goes 10.0 m up a ladder to a nozzle having an inside diameter of 3.00 cm. Calculate the Reynolds numbers for flow in the fire hose and nozzle to show that the flow in each must be turbulent. 6: At what flow rate might turbulence begin to develop in a water main with a 0.200-m diameter? Assume a temperature. 8: In Take-Home Experiment: Inhalation, we measured the average flow rate of air traveling through the trachea during each inhalation. Now calculate the average air speed in meters per second through your trachea during each inhalation. The radius of the trachea in adult humans is approximately From the data above, calculate the Reynolds number for the air flow in the trachea during inhalation. Do you expect the air flow to be laminar or turbulent? 9: Gasoline is piped underground from refineries to major users. The flow rate is (about 500 gal/min), the viscosity of gasoline is and its density is (a) What minimum diameter must the pipe have if the Reynolds number is to be less than 2000? (b) What pressure difference must be maintained along each kilometer of the pipe to maintain this flow rate? (b) The pressure is much too high. (c) The assumed flow rate is very high for a garden hose. (d) > > 3000, turbulent, contrary to the assumption of laminar flow when using this equation. 12.5 The Onset of Turbulence by OpenStax is licensed under a Creative Commons Attribution 4.0 International License, except where otherwise noted.